Although we’ve been quiet on the blogosphere, there are a lot of things happening at Miro Tea, not least of which include a lot of cool events and fun changes around the store. On the tea end, things have been exciting. Our source in Taiwan has supplied us with a clutch of really impressive teas–both classic Taiwan oolongs as well as some very interesting and more unusual teas, some of which I’ve never even heard of before! As we introduce the new teas to the staff, first impressions are as important as ever–to one of our more poetic team members, the fresh oolongs have become known as “new-longs!” Over the next few weeks we’ll be featuring these on the blog with tasting notes and descriptions. Of course, they’ll be available in the store by the cup and pot on our enduringly-popular seasonal oolong menu, and if you get in early enough you might be able to snag a few ounces to take home! For starters, our Oxidized Buddha Hand oolong has been restocked, and this time it’s a winter harvest. This was probably my favorite of the last batch of oolongs we received from Taiwan. Buddha Hand (pinyin Fo Shou) oolong has personally intrigued me for quite a while with its enormous leaves and inimitable fruity notes. This tea is quite a pleasure to drink because the higher oxidation (which tends to bring out fruity or generally sweet notes) has amplified the Buddha Palm cultivar’s natural flavor profile into a rich autumnal (forgive the strange word choice, but it just seems to fit the way this tea tastes) fruity-floral combination. Compared with our “Green” Buddha Hand oolong (which, at the time of this writing, is still in stock), the body is a fair bit thicker. Although this tea may not develop quite as much over repeated brews, the oxidized taste is endearing and so unlike most Taiwanese oolongs that it doesn’t really matter–it’s nice to just bask in the unique flavor. Some tea leaves are called “big” because of their length, but the immensity of this cultivar’s leaves is really noticeable in the astounding breadth as shown by the gargantuan example above. 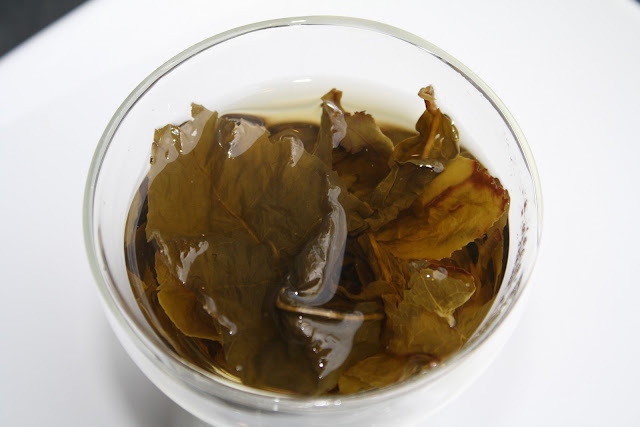 You can also see the bruised edges that have contributed to the oxidized nature of this oolong. I’m excited that we get to prolong the magic of this tea by carrying another season’s harvest–we too often have to say “goodbye” to interesting teas too soon! Stay tuned–we’ve got even more noteworthy teas on the horizon. 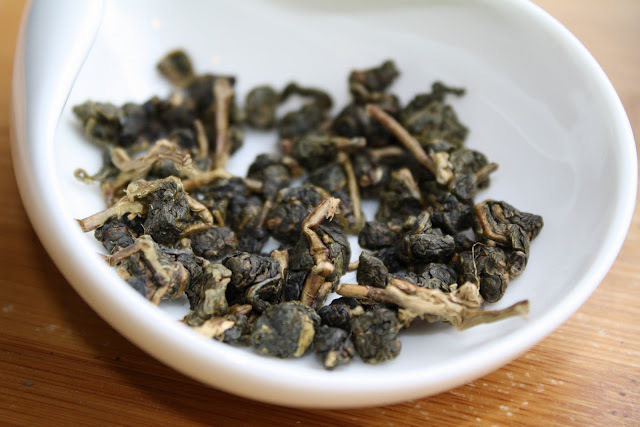 We’ll be continuing next post with our first green High Mountain Alishan Oolong in over a year.